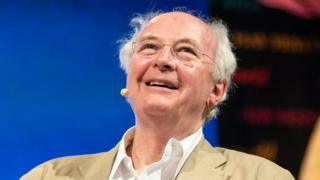 The closure of public libraries is "a disgrace to civilisation" according to bestselling author Philip Pullman. The author of His Dark Materials trilogy has been appearing at the literary festival in Hay-on-Wye in Powys. He told BBC Wales that library closures were "an act of destructive folly." "It's a disgrace to civilisation, to a country, a nation, that once had a good library service in every county and local authority," he said. The 71-year-old, who spent ten years living in Wales as a child, spoke at the annual event on Saturday, and addressed the threatened closure of the library in the town. "It seems an act of destructive folly, almost unparalleled, to allow the library service - which was so good in my lifetime - to fall into such decay so soon, so rapidly and so carelessly as if it didn't matter," he said, "As if it was just a silly little luxury that we can do without. "We can't do without it. It is absolutely, fundamentally, necessary." His talk was followed by a charity collection to help fund the library, which will be housed at a school in the town later in June. "It would be wonderful if everybody in every community rose up against the destruction of their library," he added. But he warned that middle class, wealthy areas were more likely to be able to save their libraries. "People with money and time on their hands" can get organised, he said, but in more deprived areas there are people who "haven't got the time or the contacts" to prevent library closures.